ABC News: "The residents of the Great Ape Trust are part of groundbreaking language research where the apes are being taught to communicate with humans by pressing 350 lexigrams -- symbols that appear on a screen and represent thoughts and objects." 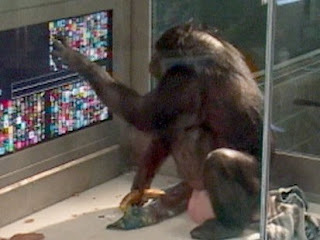 "I read Kanzi [one of the apes] a series of words, and then without fail, he hit the corresponding lexigram symbol on a touch screen. I said, "M and M."
He pressed 'M and M.'"